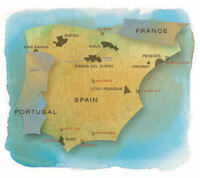 Cádiz is the most ancient city on the entire Atlantic coast of Europe. Founded by the Phoenicians in 1100BC, it was also the port of departure for Christopher Columbus on two of his great voyages. It’s most famous wines are of course the traditional Sherries from Jerez, which are undergoing quite the renaissance in recent years. These wines are largely a product of the Palomino grape, and what happens to it when it sits in the sun amid the blindingly white chalk soils. Power and depth occur as if by magic, as does the remarkable finesse that, combined, make these wines fascinating, absorbing and wondrous to drink. Hugh Johnson puts it marvellously: ‘A real fino is an expression of wine and wood as beautiful as any in the world. Tangy Oloroso style sherries or fat milk & cream expressions may be your bag, or maybe the sweet unctuous nutty Pedro Ximénez. Arm yourselves with morsels of tapas and get sipping'.